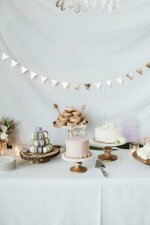 Flower Garden Baby Shower Cakes - Butterflies and Ladybugs too! 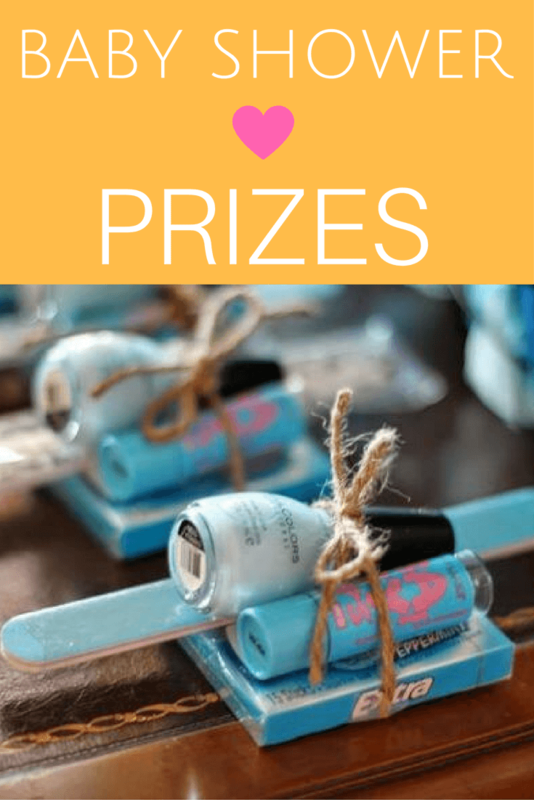 Adorable DIY ladybug, butterfly and garden baby shower cakes! I made a 10"- 8"- 6" yellow cake. All are frosted with butter cream icing that I tinted green. I frosted it with a look of mountain type green by taking a knife and pulling away from the cake at different spots. 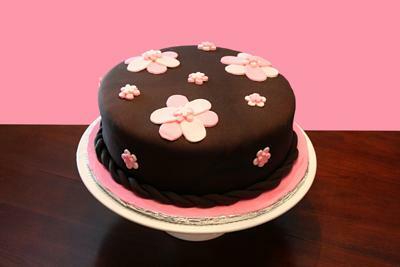 Most flowers are made with a fondant by a press that has a flower shape. All other flowers I hand made. The ladies bugs are made of fondant, tinted red and then I used a very thin floral wire that I painted with black food coloring paste as well as the dots on the lady bug. The bees are made of fondant as well. I stuck the wings in with toothpicks. I painted the eyes and stripes with black food coloring as well and then took the bottom of a cake tip to indent the smile on the mouth. The bow was made of fondant. I used a paper towel roll covered with parchment paper to shape the bow. 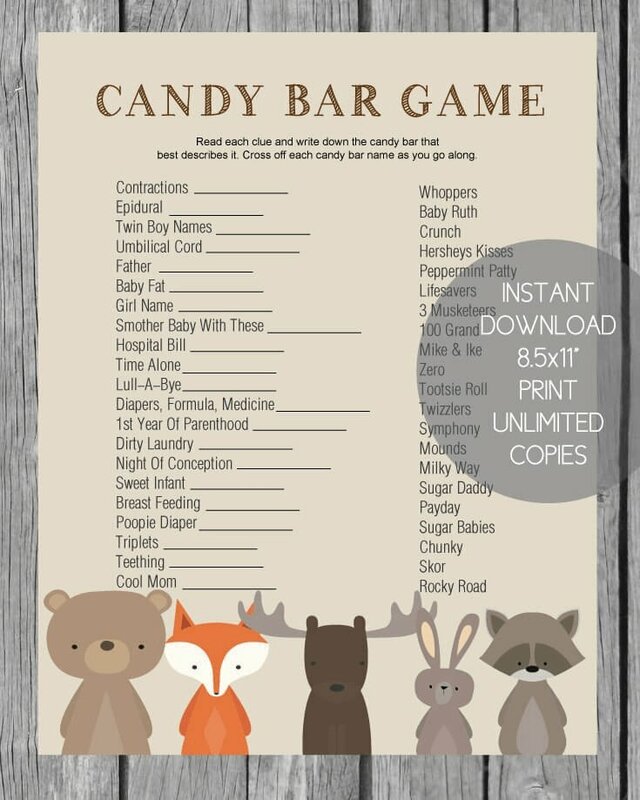 The little sign on the bottom was made of fondant and I used food writers to write the baby's name on it. The butterflies are picks. 1st PLACE WINNER IN OUR CAKE CONTEST! These little cupcakes were made for a garden themed shower for a baby girl (whose name will be Rose). These little cakes are my original design and 100% edible. Most guests enjoyed the cupcakes and saved the roses and baby as a memento as she was just too cute to eat. The cupcake measures a little over 3 1/2 across inches by about 2 1/2 inches high. The rose, the baby and the leaves are all made of hand sculpted fondant which was tinted with food coloring to create the pastel colors. The tiny white flowers were made of royal icing. The parents wedding song was "All you need is love" these words are stamped on a leaf on the side of the cupcake. The actual cupcake is carrot cake with tiny chocolate chips (combination of mom's favorite cravings). 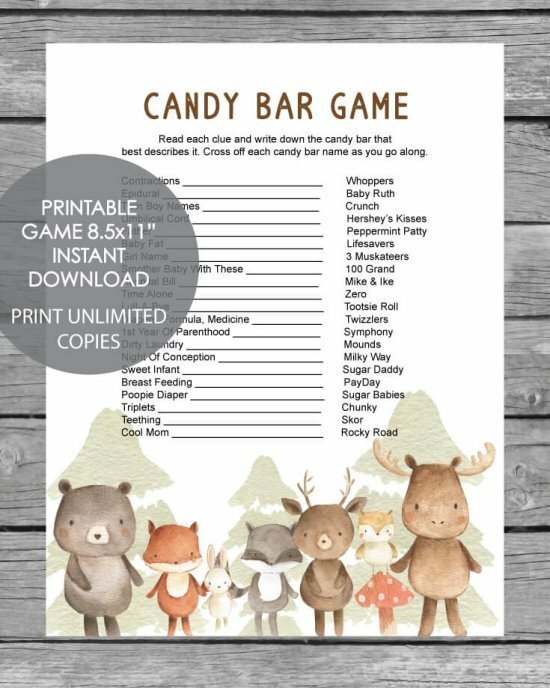 It was a little time consuming but such a fun project to make! For this Daisy & Butterfly Baby Cake I decided to do (4) 9 inch layers with alternating chocolate and sour cream pound cake. The filling was vanilla butter cream and I used homemade fondant to cover the cake and for the decorations. 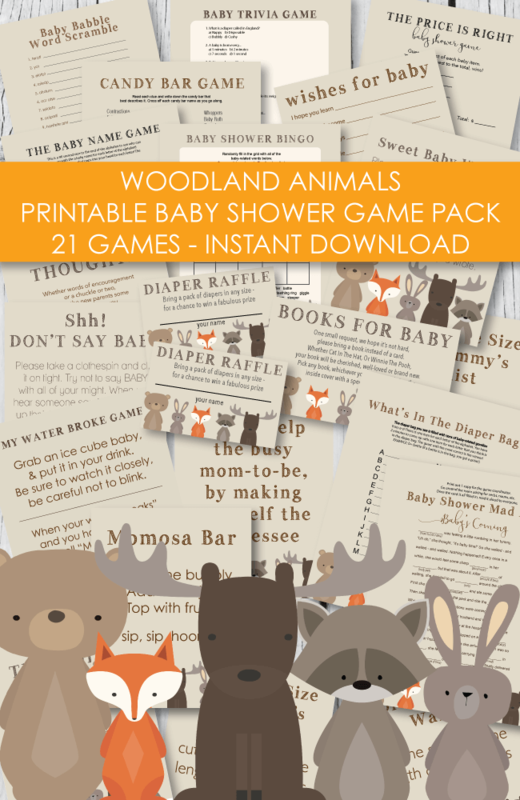 I made the flowers, baby, baby blanket, butterflies and letters in advance. For the flowers, I used homemade fondant colored with pale yellow, pink, and some I left white. I also colored a little of the fondant orange for the inside of the flowers. I used a gum paste daisy cut out and then shaped them with a flower tool with the ball end and used a toothpick to indent the petals. I let them dry on wax paper dusted with cornstarch. I then pinched tiny pieces of the orange fondant and rolled them. I placed a few of these inside each flower, attaching with fondant adhesive (fondant thinned with water), and let them dry. I used fondant with a little green coloring to make the leaves. 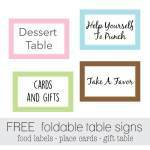 I cut them out with a leaf shaped cut out and then used a toothpick to indent the leaves. I put them on wax paper dusted with cornstarch to dry. For the baby, I colored the fondant with a little of the light copper color. I rolled out the head and the nose and used fondant colored with black coloring to make the eyes, and the hair. I also made a pink bow for the hair. I attached the hair, the bow. the nose and the eyes with fondant adhesive. I then used the copper colored fondant to make the shape of the baby body. I attached the head to the body with fondant adhesive. I made the blanket with pink fondant. I used a fondant rolling tool with attachment to make the design on the blanket. Then I used a fork to do the edges of the blanket. I attached the blanket to the baby with fondant adhesive. 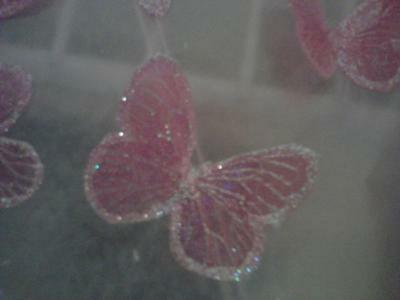 For the butterflies, I used a butterfly cut out and then let them dry in a concave tray. After they were dry I used a brush to dust them with pink and yellow pearl dust. Then I made the letters using fondant colored with pale pink, powder blue, light green and light yellow. 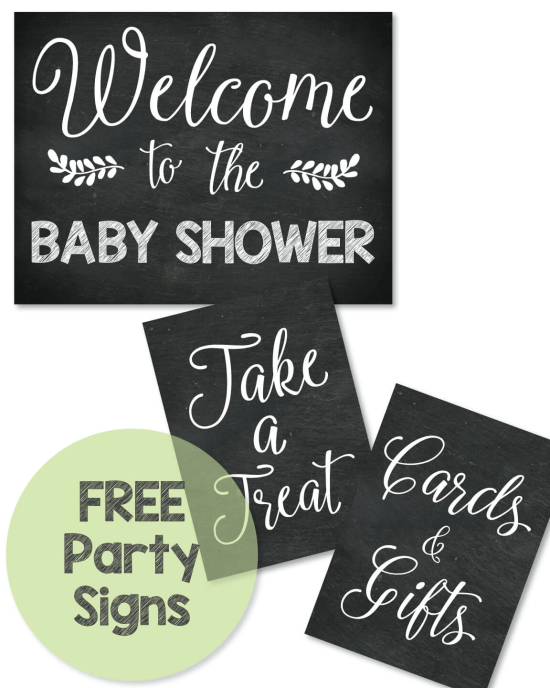 I used letter cut outs to make the letters. The next day I baked the cakes, stacked them with the icing, shaped them and put a crumb coat on. The final day I rolled out white fondant and covered the cake. I added all of the decorations using fondant adhesive. I think it turned out terrific! I made this Pink Baby Lady Bug Cake for a friends Baby Shower. 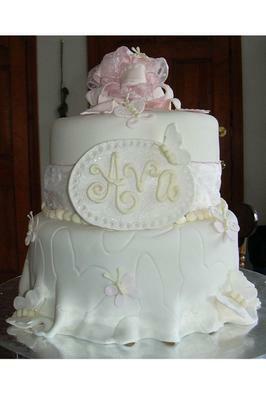 This is a two tier cake with butter-cream frosting as the filling and fondant on top. It is an all white cake. 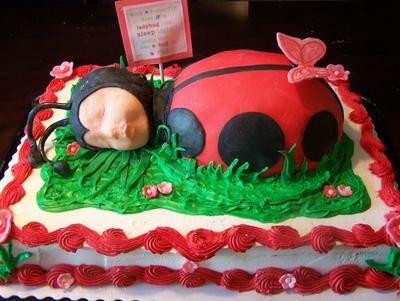 Lady Bug on top is made of fondant. 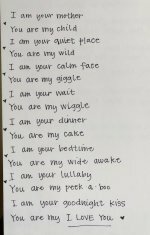 On the cake I wrote "Welcoming the little Lady". They didn't have a name picked out yet so I thought that would be the perfect saying to go with the cake. This cake was one of the easiest cakes I have made. This cake is white almond sour cream cake. The recipe can be found on Cakecentral.com the filling is standard butter cream. 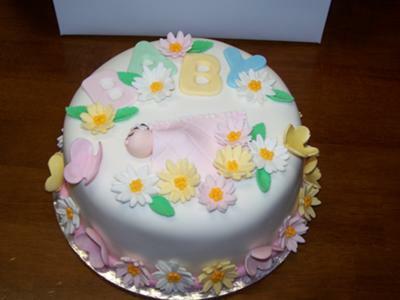 It is frosted in butter cream then covered in fondant with both fondant and butter cream decorations. 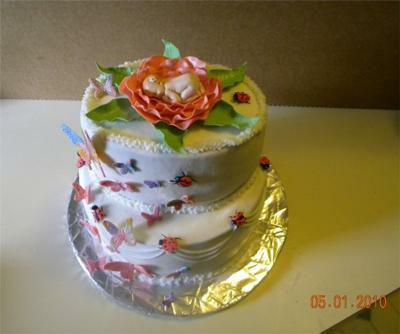 The ladybug pillars are solid fondant and doweled with wooden dowels so that the top cake does not smoosh the ladybugs or the bottom tier. 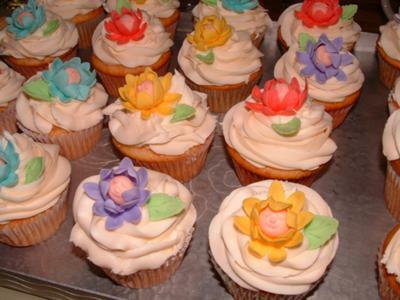 The fondant flowers were cut out and dried overnight in mini baking cups so they dried in a 3-d position. The baby was hand sculpted using fondant as well. This is by far my favorite cake I have made. 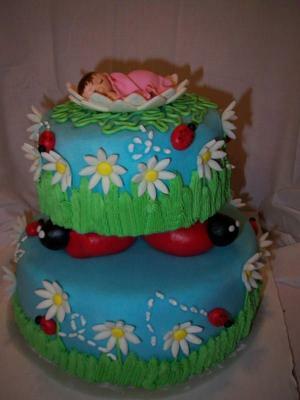 This Adorable Ladybug Baby Shower Cake Was The 1st Place Winner in Our Cake Contest! I made a regular sheet cake for the base. I used a half oval pan to make the cake for the body and a small metal bowl to bake the cake for the head. I then covered the body with butter cream frosting and a thin layer of fondant. For the head I placed a thin layer of fondant over the face of an Anne Geddes ladybug doll to get the details of the face and let it dry. Next I placed the dried form to the head piece of the cake and covered the rest with black fondant to make the mask. I made pink flowers out of fondant and sprinkled edible fairy dust on them to make them sparkle. The sign in the back reads; "With a butterfly kiss and a ladybug hug, sleep tight little one like a bug in a rug." This cake was a big hit at my friends baby shower! 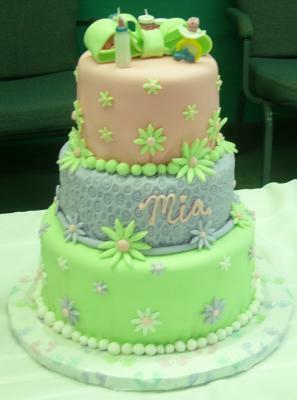 For this 3 Tier Pastel Flower Baby Shower Cake I used fondant for all three tiers, and fondant daisies. And a Fondant Bow for top! 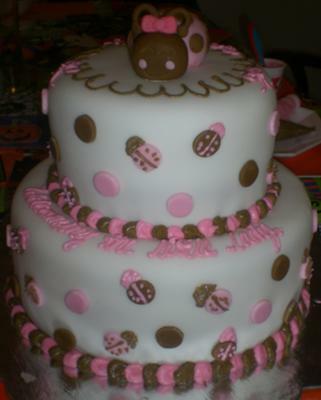 My first Baby Shower cake, It was made for my grand daughter. It was made with 2 8 inch rounds for the bottom, and 2 6 inch oval for the top. The baby's theme was butterflies and lady bugs. So the cake had butterflies going up the side, with a lady bug at each top of each drop strings. The frosting is butter cream. 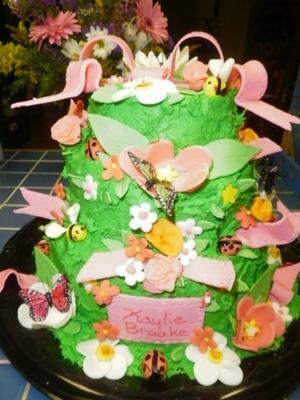 The Baby, Lady bugs, Butterflies, flower, & leaves were made out of a fondant & gum paste mixture. The baby was a mold, & the butterflies was from molds. The lady bugs, flower & leaves was hand made. The butter cream frosting was made very smooth to look like fondant. My friend wanted a simple cake that looked elegant. I did a chocolate cake with chocolate fondant and fondant flowers. The cake was very simple, but quite well received. Sometimes less is more. 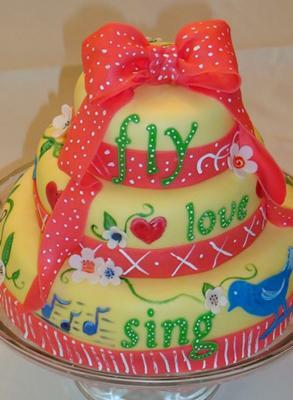 I made the Fly, Love and Sing Baby Shower Cake as a shower present for a close friend. I used a beautiful painting that she has hanging in her nursery as inspiration for the cake. I stared with an 8", 6" and 4" round cake. Once baked and cooled, I torted them and used Nutella buttercream and fresh strawberries as the filling for each tier. I used vanilla buttercream to dirty ice all three cakes before I covered them in a lemon yellow homemade marshmallow fondant. I created the bow, flowers and font with gumpaste. Once set on the cake I further embellished with lots of hand painted detail. I used a fine paintbrush and gel color to paint the center of the flowers, the hearts, leaves, vines, white polka dot accents and detail on the birds. 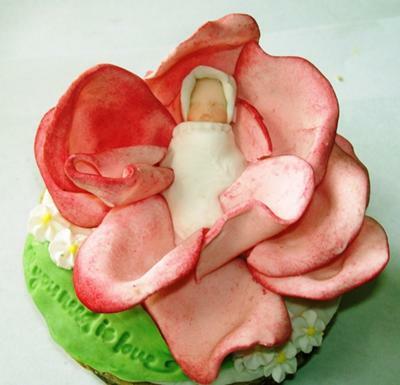 This Fly, Love and Sing Flower Baby Shower Cake is unique from the norm but meant the world to the mother-to-be. 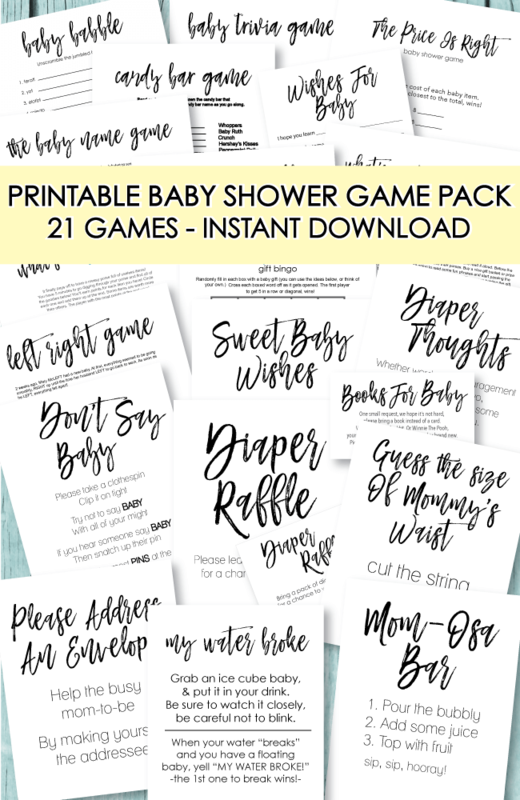 She started to cry when she saw it because it immediately made her sentimental as she thought about her beautiful nursery. In the mother's words " I hope my baby girl will fly, love and sing!" I made the baby face flowers out of fondant. I dyed the fondant and cut it out with a daisy cutter. I took the peach fondant and rolled it into little balls then made the eyes and mouth with the end of a straw. I poked a hole for the nose and attached a very small ball of fondant with vanilla flavoring. After the flowers had dried a little, I then shaped them around the faces in two layers. I had to take them out of town so I put them in egg cartons to transport. The leaves are green fondant made with a cutter and a toothpick to draw the veins on. 1. Lay out all pans and spray with non- stick coating. 2. 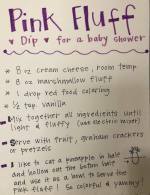 Mix and bake cakes as directed by a recipe. In this case I used Lemon Cake with Lemon curd.But any kind will do. I baked 2, 10" layers, and 2, 8" layers. 3. Allow ample time to cool. Meanwhile I cut a name plaque, loops for the bow, and butterflies out of fondant, and set them aside to dry. Then either make or use prepared frosting to lightly coat the cake. 4. Cut dowel rods and evenly space them in the center of the bottom layers, for support. 5. Roll out Fondant evenly, on a very clean surface, large enough to cover the cake. 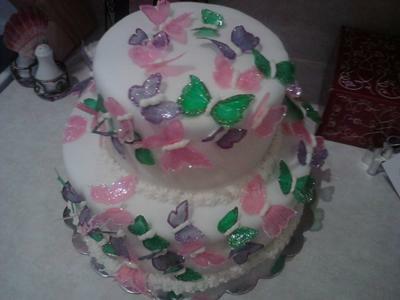 For the bottom layer I embossed a butterfly pattern before I applied it to the cake. This cake was made with a Red Velvet 12" round, and White 8" round. I used regular buttercream for the filling. The butterflies were made a week in advance with Butterfly Veining Sheets. I used Knox Gelatin, and food coloring to get the desired colors. When the gelatin is ready you brush a light layer over the individual butterfly. I made sure to put some gelatin between the wings so when they were dry you could bend them. Once they dry they come off the mold by themselves. I used scissors and cut off the extra gelatin. I then used a confectionery sugar and water mix and painted the outside of the wings, and sprinkled disco dust on them, and voila....butterflies. I covered the cakes in white fondant. To attach the butterflies, I put a small amount of buttercream where I wanted the butterfly, placed the butterfly, and then added more between the wings to make it look like a body. That's it!